Nose: Both notes from the younger and older eaux-de-vie come to the nose; the tonus of the younger ones, and then the round, voluptuous flavour of the older ones. Hints of lime blossom and vanilla come to mind. Palate: It has a light, sweet flavor with hints of marmalade confiture. It is not particularly spicy. Introducing the Vallein Tercinier Vieille Réserve Napoleon Cognac, which is a fine blend of eaux-de-vie from the Grande Champagne, Petite Champagne and Fins Bois régions. The first two cru are renowned for their chalky soil, leading to high acidity and a fabulous Cognac quality. The third has soil of a different chalkiness, producing Ugni Blanc grapes that are reminiscent of fresh fruits. The youngest in the blend is 15 years old, so you are sure to be wowed by its careful assemblage. Amongst the Vallein Tercinier collection, it is a multiple award winner, and carefully marries a young, “freshly squeezed” character with a rich velvety flavor; often typical of older Cognacs. Falling into the Napoleon age category, it is a guarantee for years of craft and careful monitoring of the eaux-de-vie, plucking them from the cellar at just the right moment. The name dates back to the Napoleonic era, when the French emperor took crates of Cognac to the island of St Helena during his exile. This bottle is a homage by the Vallein Tercinier house, who have carefully combined old and new. The Vallein Tercinier Cognac house have been operating since 1850, and have amassed five generations of knowledge about fine-tuned Cognac production. Located in the Saintonge region, they now have an extensive collection of Cognacs that really do put a spotlight on their wonderful cellar of eaux-de-vie. 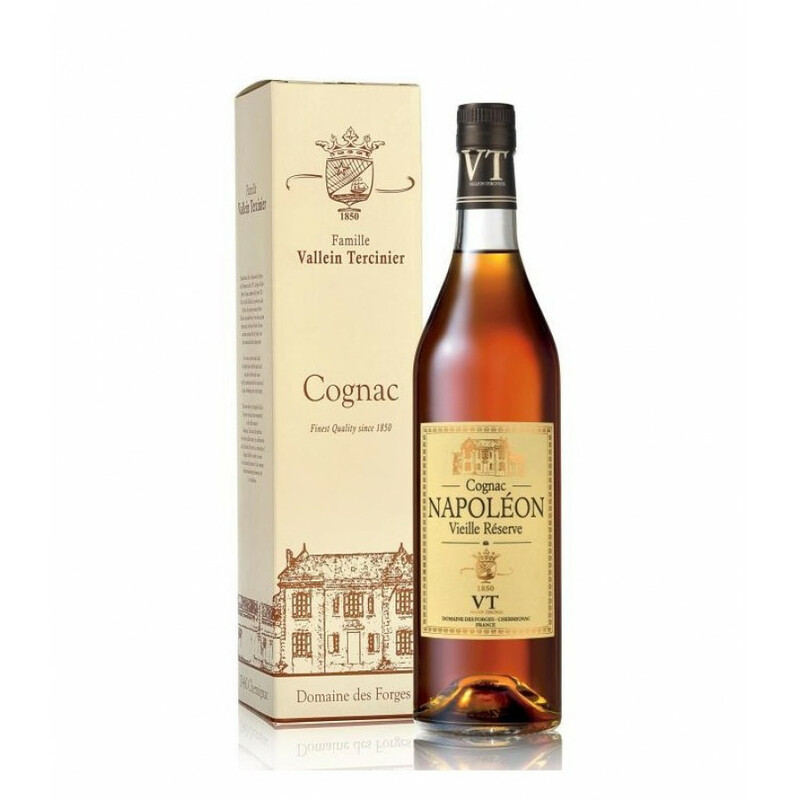 The Vallein Tercinier Napoleon Cognac arrives in a simple bottle, with a gold embellished logo. There is also a wonderful gold-leaf look illustration of the Domaine des Forges, where the magic happens for this Cognac brand.Presentation is key for this family of Cognac makers, and the box is equally as stunning. Cream with gold embellishment, an illustration of the Cognac house and family crest; you are sure to want to put this in a place for all to see. The Tercinier Napoleon can be enjoyed neat, or over ice.